N Corah operated the largest hosiery factory in Britain. Nathaniel Corah (1776 – 1832) was a Baptist from Bagworth, a Leicestershire village. Trained as a framesmith in the local knitting industry, Corah entered into business as a hosiery trader in Leicester from 1815. Corah would purchase hosiery at the Globe on Silver Street in Leicester and sell it in Birmingham. Initially he was assisted by his wife Sarah (1784 – 1856). 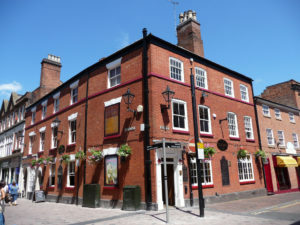 The trade was to prove successful, and Corah was able to purchase the freehold of a block of buildings in Union Street, Leicester to house his increasing stocks, in 1824. Corah’s sons, John, William and Thomas entered into the business as partners from 1830, and the firm began to trade as N Corah & Sons. N Corah & Sons relocated to a purpose-built factory on Granby Street from 1845. Steam-powered manufacturing was introduced at the new premises. John Harris Cooper (1832 – 1906) joined N Corah & Sons in 1846. The firm employed around 1,000 old hand frames for stocking manufacturing. Following the completion of his seven year apprenticeship, Cooper became involved in management at the firm. John Harris Cooper and Edwin Corah (1832 – 1880) acquired the business in 1857. N Corah & Sons relocated to the St Margaret’s Works in Leicester from 1865. Named after the parish in which it was located, the site originally had a floor space of two acres. The firm introduced the St Margaret’s trademark for clothing at this time. A large beam engine was operated from 1866. N Corah & Sons employed a workforce of 1,500 and produced about 2,000 tons of product annually by 1872. Upon the death of Edwin Corah in 1880, John Arthur Corah (1846 – 1917) and Alfred Corah joined Cooper in partnership, and the firm began to trade as N Corah, Sons & Cooper. J A Corah had previously managed the Liverpool branch of the business, and Alfred Corah had managed the Birmingham branch. Electric lighting was installed at the St Margaret’s Works from 1883. The firm paid wages substantially above average, and thus avoided strike action by its workers. The firm was a substantial benefactor to various charitable causes, especially the elderly poor of Leicester. 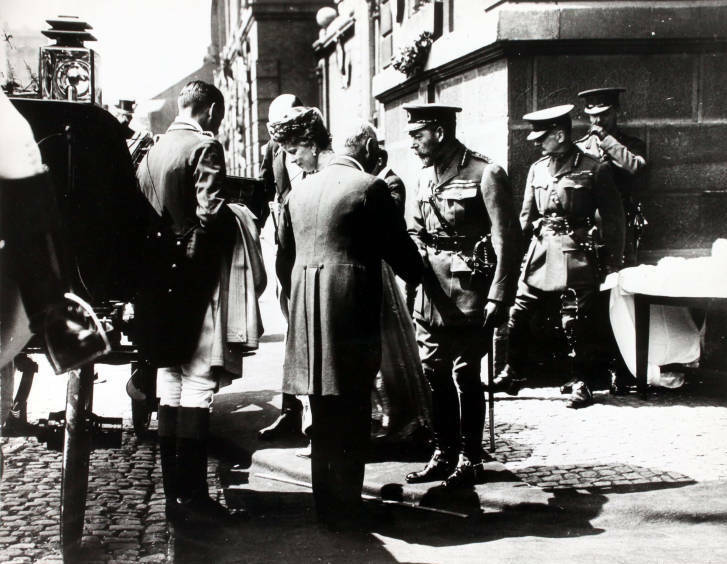 During the First World War, 50 percent of the male staff at Corah joined the armed forces. The firm produced ten million articles of knitwear, over 70 percent for government contracts. John Arthur Corah died in 1917 with a gross estate valued at £143,208. N Corah & Sons was incorporated as a private company in 1919. The St Margaret’s Works was the largest factory of its kind in Britain and probably the largest single-site hosiery works in the world. 2,500 people were employed on a five acre site. Production largely consisted of hosiery and other woollen goods. King George V visited the factory in 1919, partly in recognition of its contribution to the war effort. N Corah & Sons became a supplier to Marks & Spencer from 1926. The two companies would develop a strong relationship. Authorised capital was increased to £750,000 in 1939. 4,500 people were employed. During the Second World War, half the company’s staff either went into the armed services or were transferred to munitions production. During the war, some 26 million articles were produced. The engineering department was largely given over to producing gun parts and parts for tank landing craft. N Corah & Sons was converted into a public company in 1946. Marks & Spencer was the principal customer. The St Margaret’s Works in Leicester covered six acres and was the largest hosiery factory in Britain. Around 2,500 people were employed. Marks & Spencer was a dynamic retailer, and Lord Marks encouraged Corah to be more ambitious. Marks & Spencer made the transition from a low-cost retailer to a quality purveyor from 1951. As a major supplier, Corah too entered this transition. Encouraged by Marks & Spencer, Corah entered into a policy of long-term planning and development. To reflect the success of its trademark, the company name was changed to N Corah (St Margaret) Ltd in 1954. The St Margaret’s Works covered a floor space of twelve acres by 1965. Corah employed 6,500 people across the company. Nicholas Corah (1932 – 2010) became company chairman in the late 1960s. Marks & Spencer accounted for 75 percent of Corah sales by 1978. Corah entered into difficulty in the 1980s. It acquired Reliance, a fellow Marks & Spencer supplier, but struggled to integrate the business. This was followed by a strike at one of its factories. Meanwhile, tastes in fashion began to change. The struggling knitwear division was closed with the loss of nearly 800 jobs in 1988. Corah sold its sock division to Courtaulds for £7.5 million in cash in 1988. The loss-making Corah was acquired by Charterhall, an Australian investment group, for £27.2 million in 1988. Charterhall entered into administration in 1990. Coats Viyella, the largest textiles company in Britain, acquired Corah for around £25 million in cash in 1994.